Philip Hammond just gets better and better. I didn't used to rate him as a speaker or for his media appearances but over time the degree of knowledge and authority that he speaks with increases. His speech attacked Labour and crucially talked about the size of the problem. He spent plenty of time doing the crucial job of explaining just how much public spending has got out of control and how bleak it would make the future without positive plans. A solid performance by Osborne. Lots of detail on policy - a surprising amount. A key message was' 'We are all in it together' which was repeated many times. A good way to go. If this approach is followed to it's logical conclusion then it would become virtually unpatriotic for anyone to complain about taking their share of the pain. My only worries with Osborne's approach are that the Labour party will savage his commitments and hang the repeated inheritance tax commitment as proof positive that Osborne will hurt most people with his policies and handout more advantages to the wealthy - not true but they do have some ammunition for it. And, that the 'person in the street' simply does not understand the extent of the economic problem that exists - so will not accept the rough edges of the solution. There is more work to do there. 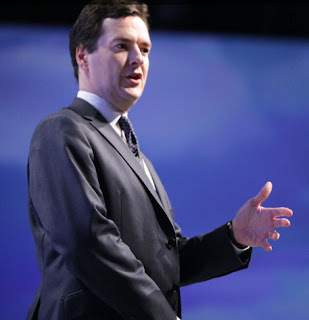 Worries aside, Osborne delivered a sensible, measured and balanced approach and importantly delivered it with gravitas.